The Cairn Terrier dog breed has a compact and strong body with a water-resistant coat and a fox-like expression. Hardy, active and game, it is an effective watch dog. The Cairn Terrier is also very affectionate and makes a good family dog. The Cairn Terrier originated in Scotland. Male Cairn Terriers range from 10 inches to 13 inches. Female Cairn Terriers range from 9 inches to 12 inches. 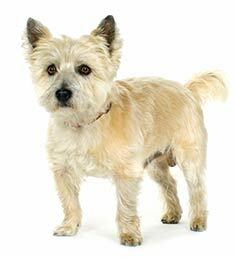 Male Cairn Terriers range from 14 to 18 pounds. Female Cairn Terriers range from 13 to 17 pounds. Cairn Terriers may be any color except white. (A white Cairn Terrier is known as a West Highland White Terrier). 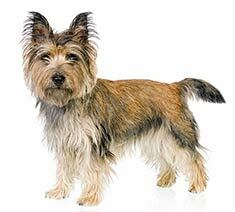 Cairn Terriers have a weather-resistant double coat with a harsh outer coat and a soft undercoat. Regular weekly brushing is required. The Cairn Terrier is a self-assured and alert dog breed who makes a good watchdog. Affectionate and loving, the Cairn Terrier is naturally patient with children. The Cairn Terrier is susceptible to allergies, gaining weight, dislocating kneecaps and hereditary eye disease. The expected life span of the Cairn Terrier is 12-15 years. Cairn Terriers do well in apartments as long as they receive sufficent amounts of exercise and attention. A future owner of this dog breed must be aware that the Cairn Terrier can be a major barker if not trained properly. The Cairn Terrier is in the Terrier group. Find Cairn Terrier Puppies with our Free Breeder search!